and follow the electrical code and use only approved materials. They can also obtain electrical permits. by the Workplace Safety and Insurance Board (WSIB)? and the expected start and completion dates.  What quality of materials will be used - high end or economy?  What warranty is the electrician offering on labour and materials? determine the extent of the work.  Ask for references and use them. organizations like Electrical Safety Authority or Ontario Electrical League. type and quality of work and level of service. of the fee up front. Friends, family, other trades who are licensed may be able to do some of the basics, however a qualified electrician can take professional care of your needs. 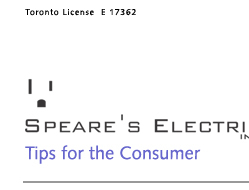 Electrical contractors licensed to work in the Toronto area have a Master Electrician license and are issued an E number that should be displayed on business cards and invoices. Ceiling fixtures and chandeliers: provide general lighting. Dimmers: add drama and atmosphere. Hanging fixtures, such as those used in a foyer, provide general lighting at a comfortable level. Pendants: a versatile way to create task or general lighting. For a stylish accent, consider multiple pendants at various heights over a particular area. Portable lamps: provide general, task, and accent lighting. Table lamps, floor lamps: versatile enough to complement any style of décor. Recessed lighting: hidden in your ceiling while offering general, task, and accent lighting. Ideal for lighting artwork, for home offices or adding interest and drama to a room. Track lighting: versatile enough to offer any form of lighting. Wall-mounted fixtures: offer general, task, and accent lighting. Dimmers can create a whole new look in your home. Go from the practicality of bright lights for reading or cooking to low lighting for a romantic evening or movie viewing. Whether it's for your home theatre, home office, dining room, bathroom or bedroom, there are many dimmer options. You can even get a wireless radio frequency (RF) whole-home control system that requires no new wiring. Dimming your lights also cuts down on your electricity bill and makes your bulbs last a lot longer. There are several types of dimmers on the market today: . of the previous lighting level. .
 Slide dimmers provide full-range, manual dimming control. .
 Rotary dimmers offer full-range, manual dimming control. light on and off and return to the previous lighting level. with hand held wireless remote controls. All light bulbs are not created equal. That's why it's important to choose the one that provides the lighting you need. Of course, you need the right bulb for your fixture. Light bulbs come in three main types - incandescent, fluorescent, and halogen. Within these categories you can get various shapes, sizes and levels of light. Incandescent: 'Screw-in' bulbs used in most lamps. Available in different colors and energy saving models. Fluorescent: Good for lighting entire rooms since they produce more light per watt. Longer life than incandescents. Newer compact models are perfect for use in desk lamps and wall sconces. Halogen: Gives you an instant-on white light and generates up to 30 per cent more light than incandescents. Longer shelf life, but they also cost more than incandescents. Quality halogen light brings out the richness of stone and natural materials. fixture. Never exceed the wattage specified on the fixture.  Use outdoor weather-proof bulbs for exterior lights. while the GU10 bulb lasts about 2,000 hours.  Never touch the glass envelope when replacing halogen bulbs. The salts in your skin oils penetrate and weaken the glass. doesn't just burn out, the bulb envelope shatters. is equivalent to regular 40-watt bulb. with a long life. Check to make sure they fit your fixture and provide enough light. Before you have your electrician install a bathroom fan, make sure you have an outside exhaust with an insulated pipe. Buy the proper size fan for the room and think about the noise level. Lower priced fans are noisier. Check how many sones (how sound levels are measured) in a fan. To judge the noise level, consider that one sone is equivalent to the sound level of a refrigerator. A good energy efficient option for a fan is an electronic timer that will turn off the fan after a preset period. The exhaust fan can remove the moist air then shut off automatically after a preset time.